Christmas jumpers have fast become the number one must-have piece in everybody’s winter wardrobe, and we know finding the perfect one can be a bit of a mission. Whether you’re in need of some new festive knitwear for the office charity Christmas jumper day or to ensure you’re the best dressed lad out for a tipple in the Cathedral Quarter, we’ve got you covered. Yeooo ho ho! Harp have released 12 limited edition jumpers, all complete with a Norn Iron spin. 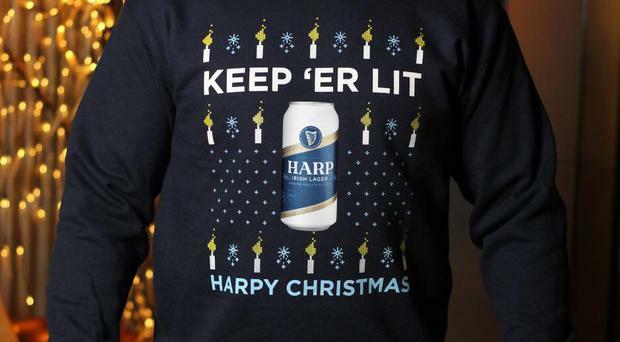 These limited edition Harp Christmas jumpers are the most coveted on the market and are extremely exclusive as they can’t be purchased in stores. That’s right - the only way you can get your paws on one of these pure belter jumpers is to win one! Keep an eye on Harp’s Facebook page for giveaways. Have a very #HarpyChristmas and celebrate our unique way with words with one of these craic-er slogan jumpers that will have your mates green with envy. The nation’s favourite environmentalist is currently blowing our minds with his latest ‘Dynasties’ series. This festive red and green knit pays homage to Sir David Attenbrrr and his global warming campaigns, featuring a planet on the back and a reminder to ‘stay cool’. Christmas jumpers are the cherry on top of every festive family portrait and now your beloved hound can get in on the action too. These matching dog and owner jumpers come in loads of sizes, so whether you’ve got a pint-sized Chihuahua or a whopping Great Dane, there's a great 'gram opportunity for everybody. Wearing a Christmas jumper with integrated festive lights might make you a walking potential fire hazard, but that doesn’t mean you have to miss out on a good novelty jumper. This ‘jingle bells’ jumper comes complete with your own musical instrument, so stick on a bit of Buble and get practicing. This jumper resembles a more traditional-style Christmas knit but has a subtle festive-film twist. It comes complete with the slogan, “Merry Christmas ya filthy animal” - a play on the iconic line from everyone’s favourite Christmas movie, Home Alone. Entrants must be 18 or over and live in Northern Ireland. Drink Responsibly. Drinkaware.co.uk for the facts.